Giving students choices can help them be more engaged and responsible for their own learning. But how exactly should this work? 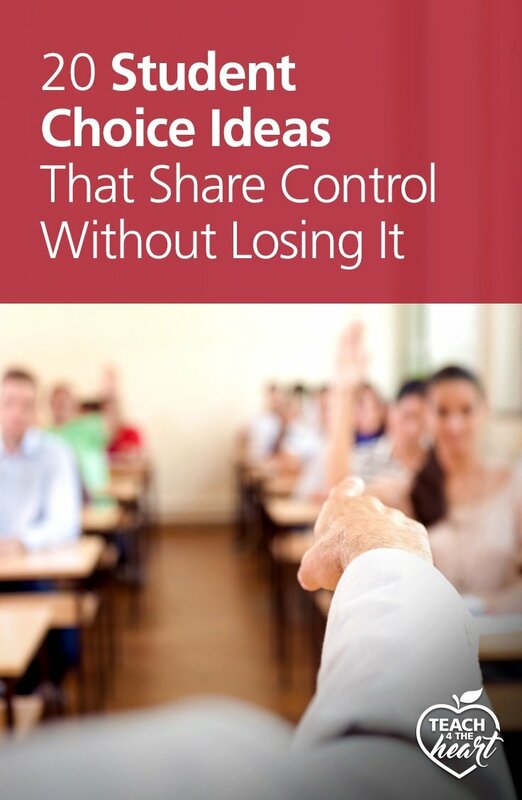 Let's explore twenty student choice ideas - and tips for how to share and delegate control without abdicating it. I’ll be honest. When I first heard the concept of student choice I was skeptical. Doesn’t the teacher know better than the students what needs to be done and why? Wouldn’t this mean giving up our authority in deference to a worldview that worries more about self-esteem than personal responsibility? For each choice you offer, give 2-3 options, all of which will make you happy. Giving choices doesn’t have to mean we abdicate our responsibility or authority. Instead, we simply share control in areas where both options will help them learn and grow. This doesn’t mean the choice is meaningless. No, these are real choices. But the key is that we’ve thought through both options and know that both would be good for the students and the class. We don’t let students choose when we know one choice is clearly a detrimental one. In this way, we get students involved and help them be more responsible for their own learning (something we talk a lot about in our new course Beyond Classroom Management: Create a culture of respect, responsibility & engagement). As they feel more in control, they’re also more likely to follow our instructions during times where we can’t give a choice but instead must tell them exactly what to do. So let’s get super practical. What does this actually look like? What choices might we give in our classrooms? Well, that’s totally going to depend on you, your teaching style, the ages of your students, what you teach, and a million other factors. So, while I’m about to give you a list of student choice ideas, please realize that these are just that – ideas. Some of them would never work with your students. Others may be perfect. The point isn’t to implement them all but to pick out a few that might work for you – and to spark your own creativity to imagine other ways in which you could share control. Sound good? Here we go…. Work by yourself or quietly with a partner. Complete the even or the odd-numbered problems. Walk in two lines or one. Practice poetry (or any other memory work) at the beginning or end of class. Choose which topic to discuss (out of 2-3 good options). Start at center #1 or center #2. Take the test on Friday or Monday. Deliver their report in writing, orally, or through a multimedia presentation. Make your own study guide or review your notes. Practice problems on paper or complete a review activity online. Choose which of the two songs to sing at the school assembly. Practice spelling words in one of three ways. Turn in homework throughout the week or all at once. Choose which service project to do as a class. Proofread your paper yourself or switch with a friend and proofread each other’s. These types of choices make it easy to start giving students more control without being overwhelming or intimidating. 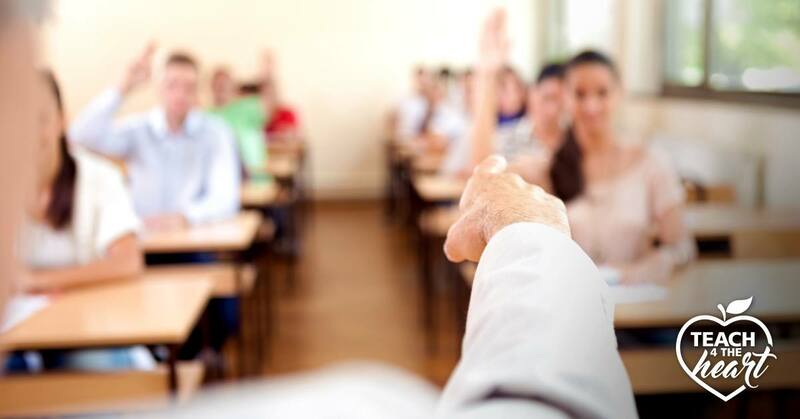 Once you see your students practicing making decisions, discovering what works for them, and learning to be more responsible for their own education, you may even decide to let your students choose even more. p.s. We’d love to hear what choices you give students in your classroom. Share them with a comment below. Disclaimer: Links may be affiliate links. This means that if you end up purchasing a product after clicking on the links, Teach 4 the Heart will receive a percentage of your purchase at no extra cost to you. Thanks for helping support Teach 4 the Heart in this way. I allow my students to choose from several learning enrichment activities when they finish their work early. I find that they sometimes get to class early just so they can check out their options for the day. One that’s a big hit is a manipulative bulletin board, where I have pictures to be labeled in German by matching cards with words or phrases to the pictures. I also keep a jigsaw puzzle and several games on the table, as well as mazes, adult coloring pages, and puzzle pages in a basket equipped with colored pencils. I find that I get a lot of cooperation from my students because I work with them to determine when to schedule tests, based on how many other tests they have to study for already. Once we set a date, they try hard to honor our agreement and study. One thing I want to do is give my five year old students more choices during reading workshop. I brought in a letter-robot manipulative that they like but I am not sure they will follow the directions in using them, they are supposed use the letters to make out high frequency words. Since there is only one set there are no repeat letters, so this would need to be done with words that don’t have overlapping letters. I also gave them their own play do jar to use with letters to make HF words in which there are more words available. I am desperate to find anything that will keep their attention while I have reading groups. They take a long time to make choices but I want to implement choice in some way.